This was the first beach we went to given its proximity to the airport. It is surrounded by beautiful scenery, with short rocky beds, a stretch of white sand and turquoise shore. Unfortunately for us, we weren't able to spot any, but apparently during the high summer season, you may even be lucky to see some dolphins swimming around. This beach can be quite crowded, but that is due to all the activities available such as windsurfing, jet skiing, diving and snorkelling. It is also a very family friendly beach, with a bar and restaurant conveniently located at the beginning of the beach, and sun loungers and umbrellas readily to be rented (although you're better off buying an umbrella for around 10 euros, available at pretty much any beach). 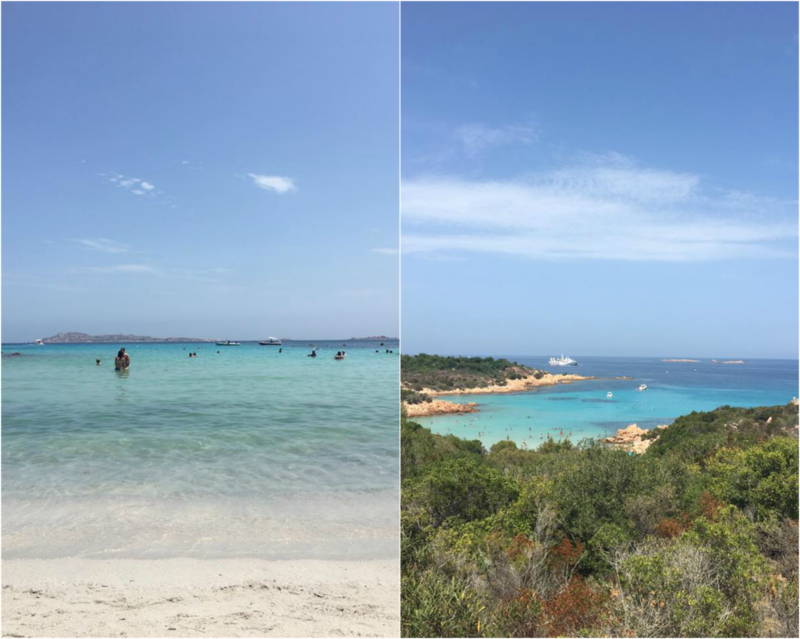 Awarded one of the best beaches of Costa Smeralda, this is a must for any adventure lover. A good tip for this one is to wear some sort of trainers as it is a 10-minute walk through a rocky path. But it is totally worth it as the beach features gorgeous white sandy and clear water. It is quite a small beach, with only 250 meters in total so getting there early for a good spot is essential. If you're a fan of snorkelling, this beach also boasts a wide range of small fishes as waters are quite shallow. There is also a small bar that serves lunch, ice cream and a wide range of drinks. Albeit this is a little further out from Olbia, it is a must as it is the best way to see the Maddalena archipelago in Sardinia. There are many options to see the island by boat, with the cheapest options offering half day trips but boats are incredibly crowded. We chose instead to spend a little more (90 euros per head) and go for a more private trip on a motor yacht, which can accommodate a max of 20 people. This trip takes you around various beaches, famous spots like the pink beach, and allows you to swim in the gorgeous open turquoise sea. It is a whole day trip, leaving the port of Palau at 10/11am and only returning at 5/6pm. For the price, service, food and activities are all included. The food on board (typically Italian) is incredibly tasty and they even cater for different dietary needs. Appetisers and drinks, including wine, are also available throughout the day. Carlo, the captain, and his wife are very friendly and charming and they make you feel right at home. It is important to note however that given this is one of the famous boat trips available, booking in advance is essential. It is quite costly compared to some alternatives but it is worth every penny! Further out from Olbia, but after the 2-hour drive we were awarded with the most beautiful natural pool. La Pelosa beach boosts shallow turquoise waters and white sand, so it comes as no surprise that it has been awarded one of the best beaches in Europe! From the beach, you can observe the ancient sixteenth-century watchtower, the Torre della Pelosa, that used to be part of Sardinia's marine defense system. With a multitude of restaurants and bars all around, you can easily make a day trip to this oasis! Some even say that La Pelosa is also an excellent chance to experience the Caribbean at a fraction of the cost! Caprera is yet another island near Sardinia, accessible from La Maddalena island by a joining bridge. Here you can find smaller beaches, all of which are true nature's jewels. Cala Coticcio is one of these, being surrounded by rocky structures. This is not one for the faint hearts as it requires a fairly arduous 30-40 minute hike down (and back up). It is extremely important to wear the right shoes and take some water with you as the heat is not forgiving. To access the beach, simply follow the green dots spread around that make the hike a little easier. We spent a little more than half a day at this beach, and by the time we left the place was absolutely crowded. It is not the biggest beach nor does it have much sand space, but the view and the water colour are stunning. My husband found this to be the best place for snorkelling so if you're into that sort of thing, every step down is totally worth it. Thanks for reading beauties and have a great week! These are some really stunning beaches!! You deserve places like this! You're giving me serious wanderlust. Also, I don't go to the beach enough. Great pics! Oh my goodness, so gorgeous. I need a sunny holiday - Bournemouth doesn't count lol. The blue of the sea is simply stunning. Pam, all these beaches are gorgeous! Being from New York City, all our beaches are unfortunately muddied, and definitely not that bright and beautiful blue. That boat tour sounds so lovely too! The photos are amaizing! Such a beutiful place. Beautiful photos! Would love to check out these beaches one day! Thanks for sharing dear! Amazing post, the pictures are gorgeous, I love your blog, thank you for sharing!!! These beaches look beautiful and the colour of the sea is incredible, I can see why this was your best holiday. You can't beat good beaches and sunshine! Those beaches really look amazing. But I am sorry to hear about your husband, I hope he is feeling much better now. Belas imagens...até já me sinto a viajar também! These beaches are stunningly beautiful! It's one of my dreams to visit them! Loved to see these pictures, dear Pam! Caprera, the amazing sea, Olbia, so many amazing places! I am sorry for your husband, hope all is well now. I am always so glad by the sea, not with sun, I must confess, but water, that colour, I love that! You look amazing, loved to see you smiling! Hope you have a very lovely day! I hope that your husband is recovering well my lovely. 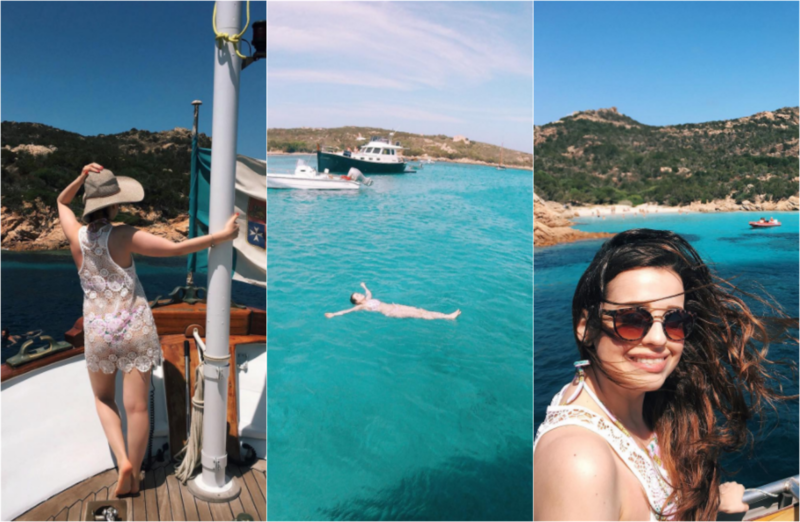 This post makes me want to jump on a plane to Sardinia as the beaches look incredible :) The sea is so turquoise. Your honeymoon was goals, every place you went to was so beautiful. I hope your husband recovers really soon, sending lots of good wishes your way! Really stunning places, love the pictures.